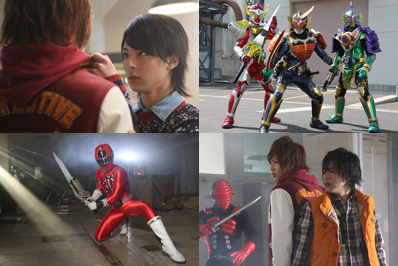 Next week, the ToQgers meet the Kamen Riders of Zawame City in this hour-long Super Hero Time special. Just as they plan to go and try the local food, the team is confronted by a monster somehow more nostalgic than your usual Shadow Monster. Then, a massive orange falls from the sky. “Hanamichi, On Stage”? You mean: All Aboard! The ToQgers transform. Kōta arrives and transforms into Kamen Rider Gaim. The monster’s identity is MoguraRoid, of the Underground Empire Badan. MoguraRoid creates a crack and calls in Lion Inves. The Inves attacks MoguraRoid and chaos ensues. Gaim takes Lion Inves with him to Helheim Forest. ToQ-1 follows them. ToQ-2 and the others fight alongside Kamen Rider Ryugen to defeat MoguraRoid and his grunts. 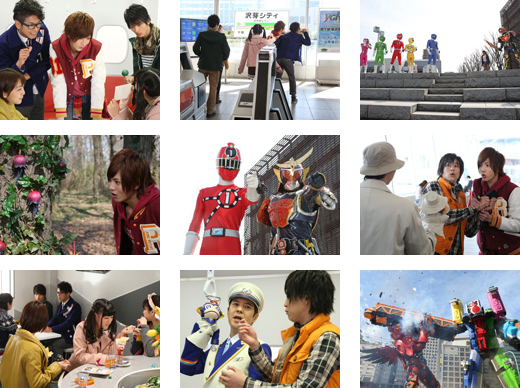 Tokatti and Mitsuzane, after untransforming, start thinking of a strategy while Mio, Kagura and Mai enjoy a parfait. What is the Underground Empire Badan? What is the identity of the monster who can create cracks?